Kenya opposition leader Raila Odinga said he rejected results from the country’s election commission on Tuesday’s presidential vote, raising fears his supporters could mount street protests. “They (the results) are fictitious, they are fake,” he told a news conference, saying the election board was required by law to display forms signed by party observers from each polling center certifying the results and had not done so. 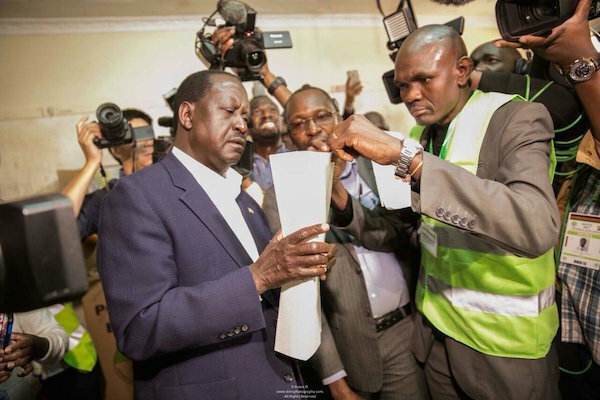 Instead, the election board was displaying a running tally on its website that showed President Uhuru Kenyatta leading with 55 percent of the vote to Odinga’s 44 percent after nearly three-quarters of polling stations had reported results. 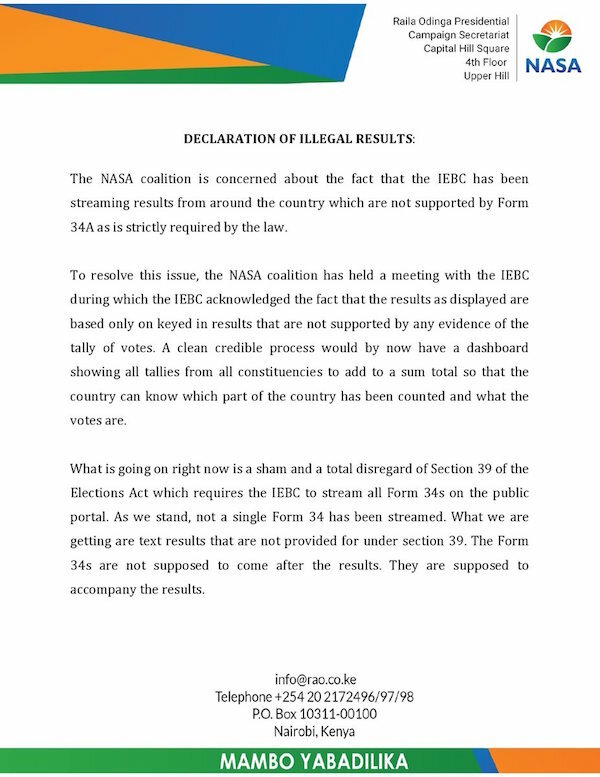 Odinga rejected those numbers, saying Kenyatta’s lead had been suspiciously constant since tallying began and did not jibe with what his own party agents were telling him. “We have our projections from our agents which show we are ahead by far,” he said. Under Kenyan law, results from each polling station should be recorded on a form that is signed by observers from each party in the polling station, then posted by the election board on a public website. 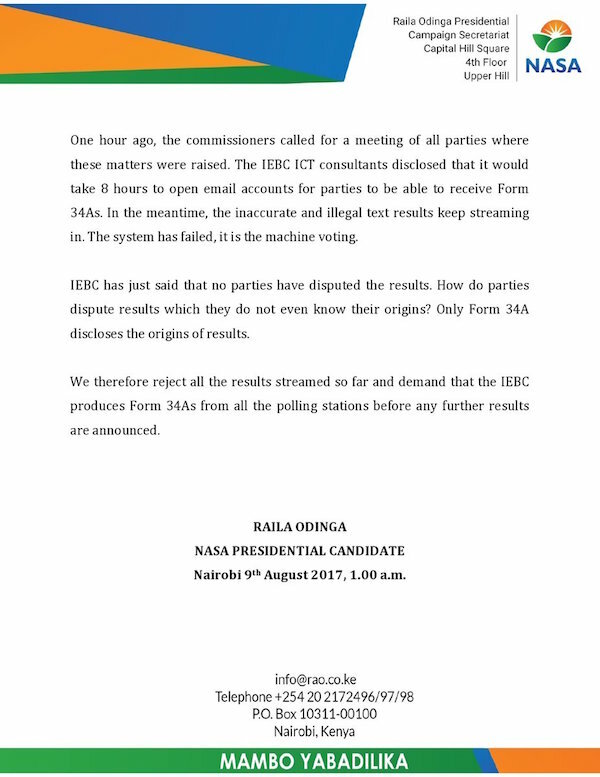 The measure is supposed to help ensure the elections are not rigged and parties can cross-check results. Odinga ran in Kenya’s last two elections and lost both, blaming vote rigging following irregularities at the polls. In 2007, his call for protests sparked ethnic violence that killed 1,200 people. In 2013, he quelled clashes by taking his concerns to court. This time, he invoked the unsolved torture and murder of a top election official days before the vote to justify his fears of rigging. “We fear this was exactly the reason Chris Msando was assassinated, so this could happen,” he said.